El Capitan the morning after a winter storm. Our mission at SuperTopo is to create the world's best climbing guidebooks. In 1999, I decided to start SuperTopo as a result of a need and a surprise. My surprise was finding how much the climbing experience is enhanced by hearing the rich history of first ascents. When you read about a first ascent done with minimal equipment in epic conditions by one of your heroes such as John Muir or Yvon Chouinard, the climb takes on a whole new light. The climb becomes an experience of walking in the footsteps of a legend. SuperTopo.com is designed to be a resource to help you plan a climbing itinerary, as well as get the best topos available for those climbs. 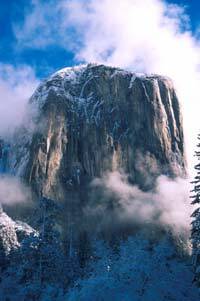 We currently include detailed info on over 380 of Yosemite's best big wall and free climbs including photos, stats, links for related sites, and user submitted beta with the latest info. Be sure to download one of our free SuperTopos guidebook examples. I hope you'll find our topos the most detailed and helpful you've ever used. Chris at Big Sur, 2008. Outside Magazine has called Chris one of the worlds finest aid climbers. Hes the winner of the 1999 Bates Award from the American Alpine Club and founder of the American Safe Climbing Association, a nonprofit group that has replaced over 5000 dangerous anchor bolts. He is a graduate of UC Berkeley and serves on the board of the ASCA, and Rowell Legacy Committee. He has a rarely updated Chris McNamara.com, and also runs a Lake Tahoe rental home business. Chris is also the founder of OutdoorGearLab and TechGearLab which were spawned from SuperTopo's successful climbing gear review section. After 3 years, SuperTopo's gear reviews naturally expanded beyond just climbing gear to include hiking, backpacking, and camping gear; it was spun out to it's own site, www.OutdoorGearLab.com, in 2011, but remains linked here on it's original home turf. Not too long ago, Randy was living his lifelong dream of spending every day engaged in childish and irresponsible behavior. Then he met Chris Mac and a few other evil people who put him back to workat least for the time being. Randy may be the worlds heaviest coffee drinker. He starts the morning with a triple cappuccino quickly followed by two cups from his press pot. For lunch, a cappuccino and another press pot. In the afternoon, a dopio machiato and for dinner another press pot. This may not be healthy. Randy considers himself a kindred spirit to poseur climbers and wannabes everywhere, people like him who seek out climbs with great views, heroic photo opportunities, easy climbing, great pro and a one-move crux. Randy is the co-owner of SuperTopo, reports on new gear, is developer of the database, and head web guru of the SuperTopo web site. He is also the web developer of both OutdoorGearLab and its sister sites, TechGearLab and BabyGearLab which focus on reviewing tech products and baby products respectively. Steve McNamara is senior editor at SuperTopo and manages the shipping and inventory. For 37 years he was editor and publisher of Pacific Sun, the alternative newsweekly serving Californias Marin and Sonoma Counties. Prior to the Sun, McNamara was at the Winston-Salem (N.C.) Journal as a police reporter, at the Miami Herald as a sports writer and the San Francisco Examiner as assistant news editor, executive sports editor and Sunday editor. He was also a contributing editor for Car and Driver magazine covering the Grand Prix racing circuit in Europe. His big wall experience leans heavily toward Yosemites Mountain Room Bar and a lawn chair in El Cap Meadow. Steve now serves as advisor to the San Quentin News, the only inmate-produced newspaper in California. At work, with climbing on his mind. David logs many more hours in front of a computer screen immersed in Photoshop than actually hanging out on the big walls of the world. Nevertheless, climbing occupies a much bigger portion of his conscious brain than it should. Sport climbing on the East Side, trad lines at The Leap, Valley cracks and the plastic at Class 5 are all favorites. He lives with his wife Elisa and dog Enzo in San Rafael, California. When not working on projects for SuperTopo he runs his own graphic design business, David Safanda Design Solutions. Surrounded by avid Mac fans at SuperTopo, David wants it known that he does all graphic design work on a PC. His goal is to one day lure the rest of the team to the dark side. Don't miss David's amazing Zion Big Wall flash movie. David is also the designer of the OutdoorGearLab logo and award icons. Greg has been climbing since 94, and he can tell you every move on every route hes ever done, draw a topo from memory, give you his opinion on the rating of any pitch or section, repeat anything written in any guidebook about it, and tell you about the weather that day. After amassing a small fortune from stock options earned during his tenure at Planet Granite climbing gym, he went into early retirement and started replacing hundreds of bolts on climbs all over California. Recently, he agreed to stop living out of his haul bag and take over as Director of the American Safe Climbing Association. Greg is currently developing SuperTopos for the Tuolumne Meadows area of Yosemite National Park. You can see some of his outstanding work by downloading our free topo of Fairview Dome, Regular Route. He lives in Mammoth Lakes, California. Always on a cool road trip. Here in Castle Valley. Joe Puryear once had the novel idea of writing a guide book for Alaska. Little did he know that he would end up designing all the topos and help lay out the book as well. But even more fun was watching Chris McNamara nearly take the plunge into numerous crevasses while walking around unroped on showshoes during his first climbing trip to the Alaska Range. After not killing Chris, Joe’s been helping design topos and maps on various SuperTopo projects. Though sitting in front of a computer (a PC mind you) absorbs most of his time at home, Joe is normally out seeking new mountains to climb around the world. More about Joe’s climbing exploits can be found at www.joepuryear.blogspot.com. Joe’s graphic design, photography, and consulting business can be found at www.cascadeimages.com. He wrote perhaps the best Desert Towers trip report ever on the SuperTopo Forum. Chris Summit (yes it's his real name) was born to climb. A Northern California native he started climbing and bouldering at his hometown crags Goat Rock and Mt St Helena in the North Bay Area in 1989. Since then he has authored many sport climbs and traditional style first ascents in the area as well as many new boulder problems. He has also authored 7 guidebooks on climbing and bouldering in Northern California. In the early 1990's he self published his first micro guidebook to his local Mt St Helena that evolved into the popular but now out of print Wine Country Rocks. More recently, for SuperTopo, he helped create the bestselling Bay Area Bouldering, Northern California Bouldering, Tuolumne Bouldering and Bay Area Top Ropes. He also authored, with Tom Slater and Maximus Press, the massive California Road-trip A Climber's Guide Northern California. Chris has bouldered V10, sport climbed 5.13 and leads multi pitch traditional climbs but his specialty is finding and climbing new rocks in uncharted areas and establishing first ascents to share with the world. He also loves teaching budding climbers about the many benefits of indoor climbing and the infinite and priceless rewards of climbing in the great outdoors. Ian is a man of the mountains. His overwhelming desire to spend as much time in them as possible has been the reason for him to spend the last seven years living in small rooms in dusty basements cluttered with gear and in the back of his pickup (sometimes in the parking lot of the local climbing gym). This drive and focus have taken Ian into the Kichatna Spires of Alaska and the Waddington Range of British Columbia (with the help of two Mountain Fellowship Grants from the American Alpine Club) as well as extensive trips through much of the Western United States and Canada. His pursuit of guiding has been tenacious. He is the youngest person to pass his American Mountain Guides Assn Rock and Alpine Guide exams (on his way towards becoming a fully certified International Federation of Mountain Guides Associations guide). Ian also holds an American Institute for Avalanche Research and Education (AIARE) Level 3 certification as well as an AIARE Level 1 avalanche instructor certification. Ian is currently developing a new SuperTopo guidebook for Washington pass in the North Cascades. He is newly associated with the American Safe Climbing Association after replacing nearly 100 bolts in the last 2 1/2 years. As a sign of his achievements in the mountain world, Ian recently moved into a ground level apartment, complete with a room exclusively for his mounds of gear. Yosemite big wall free climber CVL. Chris Van Leuven goes by several names. In younger days it was Spaz. Nowadays, in his 30s, he prefers Chris or CVL. As for residence, that has also evolved. His all-time favorite spot was a white canvas tent cabin located in a frigid part of Yosemite Valley called Boystown. Sadly, Boystown is no more and Chris has moved to a real house in El Portal, five minutes outside the Valley’s west entrance. CVL is there when he’s not living in his grey Chevy sedan with Jake, his 60-pound dog, during extended road trips throughout the U.S. CVL was once an avid aid climber, spending time on the Big Stone with Chris Mac. But several years ago some fancy free climbers convinced him to hang up his aiders and make the switch to free. He now considers aid climbing to be passé. These days he can be found (and heard, as he has a tendency to grunt loudly while trying hard) free climbing on such formations as Leaning Tower, Half Dome and El Cap. When Chris is not grunting up walls or boulders, he's in front of his computer, tapping on his keyboard for SuperTopo, Climbing magazine and several other publications. Sometimes he does ad design work. And he builds the occasional website (his business cards read: “CVL, Freelance Whatever”). He uses his own website, to (occasionally) post updates on his journeys. Steve Roper was never much of a fan of topos until now. Routes were vague back in the old days, he says, and by using vague words we guidebook writers could ensure that climbers would get just as lost as we did. Later, when topos first appeared, he saw their usefulness but was disgusted by their crude appearance. And a wordless description meant that the history of the route was also lost, perhaps forever. In Ropers many books about climbing and backpacking, he stresses history, feeling it's an integral part of the overall experience. Think of doing the Nose without knowing the name Warren Harding! Think of doing the Stovelegs without wondering what it would be like pounding those monster pitons! The skeptic Roper now is at peace with SuperTopos, feeling that a few hundred well-chosen words placed next to a beautifully drawn topo is the best of all worlds. He is the co-author of the classic Fifty Classic Climbs of North America (with Allen Steck) and author of Camp 4: Recollections of a Yosemite Rockclimber. The longtime co-editor of Ascent, he has written many other books and has had his work appear in Rock & Ice, Climbing, Backpacker, and many other magazines. High on the Nose, El Capitan. Sarah leads SuperTopo editing and design. Her background and degree from UC Santa Barbara are in Business Economics, but when punching a ten key and living the corporate life lost its appeal, she switched careers and became an editor. In only a year, she has built of an impressive resume of projects ranging from travel guidebooks with Fodors, an independently published narrative, and, of course, numerous SuperTopo guidebooks. Sarah edits all SuperTopo content, designs topos, and pleads with the founders to meet a deadline... just once. Mid-Tyrollian on Lost Arrow Spire. Todds impressive credentials include Yosemite Search and Rescue, guiding for Yosemite Mountaineering School and structural engineering work on top-secret supersonic aircraft somewhere in the California desert. He has been climbing for over 15 years and has climbed and/or guided climbers on nearly every great climb in Yosemite Valley. In 1998 he was featured in the climbing instructional video, Introduction to Aid Climbing. He is currently developing SuperTopos for Yosemites finest free climbing routes and living with a billion dollar view as the camp host of Yellow Pines campground in Yosemite Valley. You can see some of Todds outstanding work by downloading our free SuperTopo of Half Domes classic Snake Dike. Mike is the creative guru behind Yosemite Big Walls: SuperTopos and he provides consultation on numerous subjects of questionable relevance. He's been called a climber for two decades and has racked up multitudinous ascents of stones big and small. Mike was formally schooled in graphic design at Arizona State University, and has worked professionally on both coasts. Ousley Creative, Inc. based in Santa Ana, CA, is his current employer of twelve years running. When not bounce testing portaledges or snowboarding with his wife, he's revising Ousley Creative's corporate vacation policy. Mike supplies creative aid to the Access Fund and other climbing oriented not-for-profits in addition to his staple clientele.